Eight Castleford Tigers Women players and two from Featherstone Rovers Ladies have been included in a 32-player England Women’s National Performance Squad. There are five new faces in head coach Craig Richards’ squad, including prop forward Grace Field who was player of the match in Castleford’s 80-0 opening day victory at York. 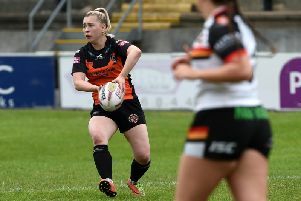 The Tigresses and St Helens boast the equal most representatives with eight each with Field joined in the squad by Castleford teammates Kelsey Gentles, Sinead Peach, Tamzin Renouf, Georgia Roche, Tara Stanley and recent signings Shona Hoyle and Rhiannion Marshall. Featherstone are presented by Andrew Dobson and Katie Hepworth. Further details of England Women’s international fixtures will be announced at a later date.